The earliest figurines were modeled by Giuseppe Gricci in the mid-1700s for the original Capodimonte factory, the Royal Factory, established by King Charles VII in Naples, Italy. These are rarely found on the secondary market today, as most reside in private collections and museums around the world. Attention to detail in posture and movement with an uncluttered look in comparison to Rococo elements often found in decorative arts and architecture of this time. 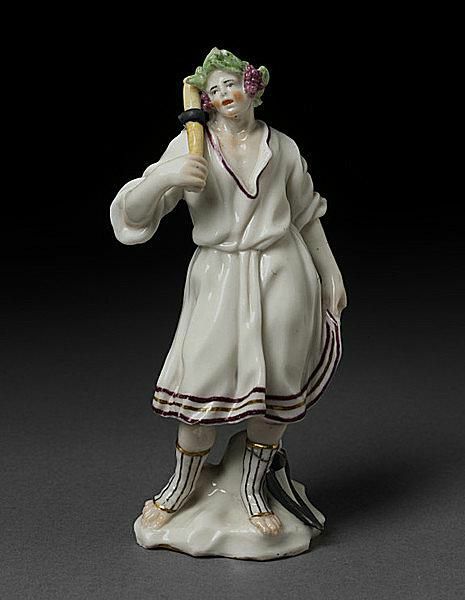 The people in early Capodimonte figurines often had small heads in comparison to the rest of the body. The bases were rocky in nature more often than not. Many early works were small or miniature in size. New developments in hard-paste porcelain in the late 1700s, however, allowed for larger and more ambitious works. Earliest pieces had no markings, but eventually bore the fleur de lis mark of Charles VII, who established the first Capodimonte factory in Naples and then later moved it to Spain. The earlier fleur de lis marks were fatter. They later changed into a thinner version usually applied on the base of a piece in either blue or gold. King Charles VII's son, Ferdinand, who was ruling in Italy while Charles held the throne in Spain, also produced Capodimonte figurines at a newly established factory in Naples, Italy in the late 1700s. The "Golden Age of Capodimonte" ended when this factory closed in the early 1800s. Pieces made there are occasionally found on the secondary market today, but most reside in private collections and in museums around the world. Second generation figurines showed a breakthrough in terms of realistic facial expressions. The traditional figurine bases were often more rounded rather than rocky in appearance and some had purely ornamental scrollwork along the edges. Many, but not all, figurines made during this time reflected life in the royal court or the newly emerging middle class which fascinated Ferdinand immensely. Ferdinand's factory began using the first crown and Neopolitan N mark. Later figurines carrying on the rich tradition of Capodimonte porcelain were made during the 20th century by many factories and studios. In fact, works of Capodimonte inspired Signora Carozzi to found the ​Industria Lombardo Porcellane latter (ILPA) in 1925. From that company, the more famous Industria Porcellane Artistche (IPA) was formed. Many artists broke away to form King's Porcelain and numerous other studios as well. Most of these pieces were marked with some form of the crown with N logo similar to that used by the second generation Capodimonte factory. If the crown and Neopolitan N mark doesn't match the older version exactly, the piece you have was not made during the late 1700s to the early 1800s. Among the Italian artists who made wares in the Capodimonte tradition during the 20th century was Antonio Borsato whose work is illustrated here. These intricate pieces are largely seen as a more modern extension of Capodimonte as noted in the book Capodimonte Collectibles by Catherine P. Bloom. The early non-figurine or floral items, such as tableware, produced by Charles VII’s Capodimonte factory in Naples, Italy and then later in Spain were plain and uncomplicated in nature in terms of their molds. Most of the decor on these pieces reflected gentile pastoral scenes or still life depictions such as fruit. These pieces are not overly remarkable, and could easily be mistaken for lesser valued pieces if they, by chance, were located on today’s secondary market. Many of these would be marked with the fleur de lis logo of the Royal Factory. Charles VII’s son, Ferdinand, oversaw a new Capodimonte factory in Naples while his father was ruling in Spain. His factory, which operated until the early 1800s, also produced items such as plates, cups, and saucers featuring more city views and sometimes depicting the excavation and historical significance of Pompeii. Other historical references such as Egyptian and mythological influences also were used in combination with neo-classical decor. These pieces would more than likely be marked with the original crown and Neopolitan N mark. Capodimonte flowers were first produced in the era of Charels VII, King of Naples, supposedly due to his severe allergies to blooming plants. It’s more likely that other kings in Europe had set the popular style of decorating their palaces with porcelain flowers and he followed suit, according to Catherine P. Bloom in the book Capodimonte Collectibles. The porcelain room at Portici, Charles VII’s royal palace, was filled with clusters of flowers and vines made in the Capodimonte Royal Factory. This remarkable room is now on display at the Capodimonte Museum in Naples. Exquisite collectible flowers handmade in the Capodimonte tradition by Napoleon, like the one shown here, are more likely to be found by collectors today. These have been made during the past several decades by a number of different companies and many of them mark their wares with a variation of the first crown and Neopolitan N mark used by the original Capodimonte factory. Some have foil labels with more identifying information such as a specific company name. Styles vary slightly from company to company with each having unique characteristics and some being more finely crafted than others. Value varies with the craftsmanship. Larger baskets filled with flowers and lamps with floral motifs bearing variations of the Capodimonte logo were also produced during the 20th century by a number of different Italian companies along with the figurines shown on page 3 of this feature. While not common, this large jewelry casket is a great example of the type of Capodimonte ware that typifies what many collectors recognize, along with floral pieces, as traditional Capodimonte. These aren't true Capodimonte pieces made at the royal factory early on, but rather items made in that style. This jewelry casket is a finely crafted, valuable piece. Like this one, many pieces of Capodimonte collectors encounter today will have a variation of the first crown and Neopolitan N mark used in the late 1700s and early 1800s. These pieces aren't nearly as old, with most produced since the 1920s. They are sometimes marked with a company name in addition to an "N" mark, or they simply bear a mark like Capodimonte Italy written in gold. These may have had a sticker label with more identifying information that has been removed or wore away over the years. To gauge the desirability of these latter items, you must look closely at the execution of the painting incorporated into the design. Valuable Capodimonte wares will have fine details, while pieces of lesser quality imitate the style but are often poorly executed. Look at how the faces are painted, for instance, to help determine the quality.